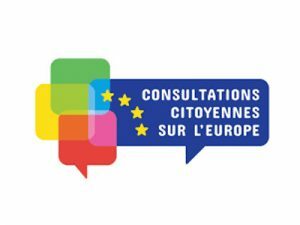 Citizens’ Consultations for the Europe of tomorrow – Allez-y! Throughout Europe, there has been a feeling of disconnection between the people and the decisions made in Brussels. Many have expressed discontent or discouragement. These consultations follow a few key principles common to all participating Member States: openness to all citizens, pluralism and transparency. Hundreds of events have already taken place in France. Overall conclusions will be presented to the Heads of State and Government ahead of the European Council meeting in December 2018. How can I participate in the the Citizens’ Consultations on Europe? Either by participating in one of the many events organised in France and/or Europe. With an interactive map of the website quelleestvotreeurope.eu, you will find the event closest to you in France. Participate in the online consultation, available in 24 languages on the European Commission website. You can express your expectations and formulate proposals by answering 12 open or closed questions created by a panel of 96 European citizens from 27 Member States. Do you want to contribute to a public debate and invite people to come and share their vision of Europe? You can have your event certified! The conclusions of exchanges you created will be presented to the European decision-makers. The conditions of the certification are specific to each participating member State. If you want to organise an event in a country different from France, you should try to find the schemes implemented in the relevant country. Do you want to discover the European institutions and their inner working, or need to form your opinion about Europe? The website touteleurope.eu offers many educational contents to inform citizens who want to better understand the stakes in relation with the future of Europe. Articles, videos and graphics are available! Also get involved in this consultation to express your concerns, hopes and expectations about the future of the EU by completing the following questionaire. This is not about drafting EU rules and regulations. This is about making your voice heard by EU leaders to help them steer the right priorities for the years ahead. This questionnaire was created by a Panel of citizens selected on a random basis. It complements other initiatives from the European Commission on the Future of Europe.